The spinal disc allows vertebrates to enjoy an incredible amount of freedom of movement. This freedom of movement can become greatly hampered when the disc becomes adversely affected. 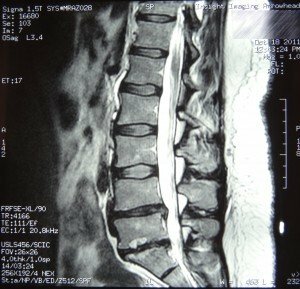 Spinal disc disorders (SDDs) are an extremely common pathology, likely to affect nearly everyone if they live long enough. SDDs are a massive burden to the population and economy, costing untold amounts of money and production loss. As NDs are aware, SDD treatments are symptom managed by allopathic medicine, even chiropractic medicine, as their treatments do little to address the underlying pathology. Spinal discs are subjected to bulging, extrusion, infection, desiccation, ankylosis, and annular tearing. The bulging disc is the most common spinal malady encountered in my practice. The spinal disc is often the punished bystander to paraspinal ligament injury. I have found with treating thousands of SDD patients, that many of them have been subjected to motor vehicle crashes or similar traumas at some point in their life. When I take a history, I am very careful to ask about vehicular collisions. I have many patients casually deny that they have been involved in a car crash until I ask them to look back into the distant past. 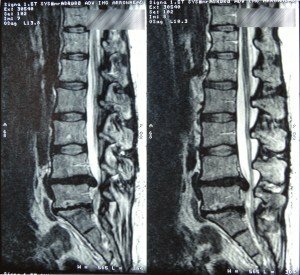 I then often hear the, Oh yeah, I was in a roll-over in the 1970s,” or “Do you mean that crash many years ago when a semi-trailer totaled my car and the Jaws of Life pried me out?” After the insurance companies and the attorneys settle, and after the dust settles, the spinal discs are often left in a hostile environment due to permanent ligament damage that holds the discs in place. Paraspinal ligament damage places the annular fibers in a hypermobile environment. What appears to be a spinal hypomobility due to muscle guarding is, in reality, a hypermobility. The body reacts to the spinal hypermobility by the slow process of vertebral fusion, radiographically identified by vertebral body spurs, facet enlargement, and ligamentum flavum hypertrophy. Acute low back pain cases have a positive correlation with annular tears and disc bulges, and it was found in one study1 that patients presenting at hospitals with acute, severe low back pain always had annular tears, and 87% of them had disc bulges. An often quoted study by Maureen Jensen, et al in 1994,2 which concluded that 52% of asymptomatic low back patients had at least 1 disc bulge, and 1% had an extrusion, does not discuss the possibility of comorbid conditions such as neck pain, mid-back pain, joint pain, or other types of pain. The study2 only excluded persons specifically without low back pain. I believe there were flaws in the criteria and conclusion. 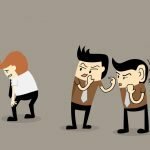 The authors make no mention if the participants had pain in other areas. Having other problem areas can certainly override one’s perception of back pain, as the brain can only experience a certain threshold of pain. 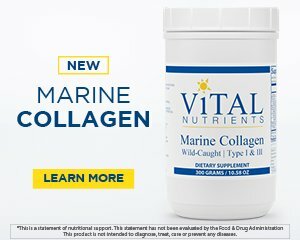 I have had many patients who could begin to “feel” other morbid areas of the body, such as joint arthritis, once their primary problem area had been fixed. It would have been interesting to follow the participants in the study2 to see if the asymptomatic bulges became symptomatic over time. It was found that the outer annular fibers were stronger and more robust than the inner annular fibers3, and the Jensen study2 population could have easily become symptomatic once the outer fibers tore. 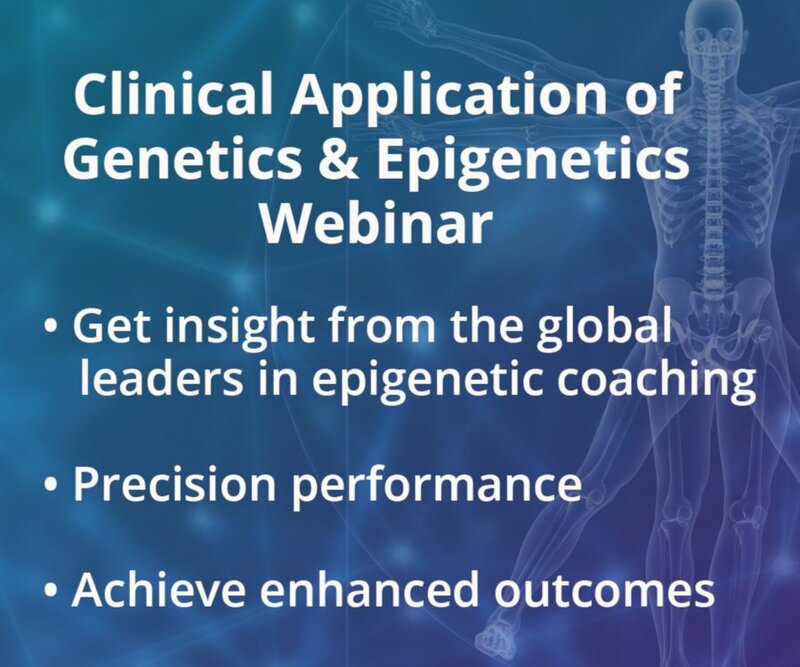 In my opinion, having a disc bulge, disc desiccation, or facet hypertrophy should not be considered a “normal” process of aging, as there is always an underlying cause when there is a deviation from one’s genetic potential. Everyone’s perception of pain is different. I have treated many patients with very minor bulges suffering tremendous pain and have seen severe extrusions cause comparatively minimal discomfort. It is my opinion that most of the pain associated with SDDs is actually muscular in origin, as the paraspinal muscles attempt to perform the task originally delegated to the ligaments. Once the ligament issue is corrected, most pain associated with SDDs will diminish, even in severely desiccated or extruded discs. A patient presented to my office with low back pain of over 2 years duration. 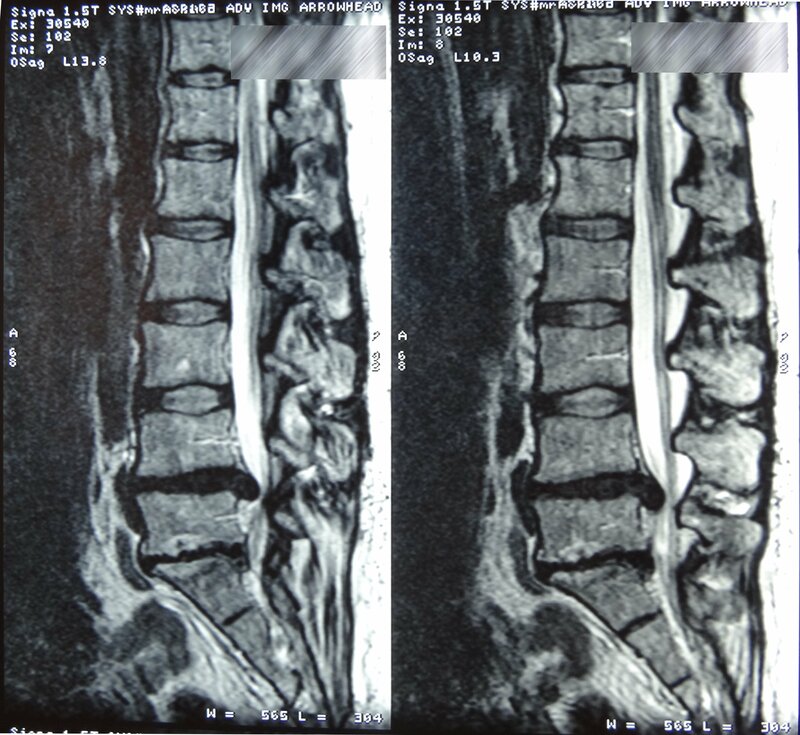 She had a recent lumbar magnetic resonance (MR) scan that demonstrated a severe disc bulge at L5-S1 and L4-5. Her history included injuring her back while carrying a heavy mattress upstairs 2 years prior to her first visit. She remembers hearing a popping sound and immediately suffering severe low back pain and radiculopathy since this injury. She reported undergoing physical therapy and the obligatory epidural cortisone shots that did not help her symptoms. She also received chiropractic care and acupuncture that afforded her temporary symptom relief. The patient reported that her daily symptoms included constant low back pain with bilateral extremity radiation, foot numbness and paresthesias, Dejerine’s triad, occasional urinary incontinence, an inability to walk for appreciable distances, and, worst of all according to the patient, an inability to pick up her grandchild without pain. She presented to my office after being evaluated by an orthopedic spine surgeon who recommended immediate decompression laminectomy and fusion of L4-5. After performing an orthopedic and MR film evaluation, I informed the patient that a referral to a surgeon was imminent if her symptoms did not improve. I recommended a course of precision treatments with prolotherapy/RIT to the facet capsules, interspinous, supraspinous, and intertransverse ligaments from L3 to S1. I deposited proliferants with a specialized direct needling technique to the aforementioned ligaments. She was treated every 5 weeks for 5 sessions, followed by 3 more treatments every 8 weeks. Her global symptoms improved with every visit with regard to pain-free range of motion, radiation of pain, and myospasms. Her urinary incontinence also abated after a few treatments. She was most pleased by being able to hold and carry her grandchild without suffering painful consequences. A follow-up MR scan was performed to reevaluate her discs. David A. Tallman, DC, ND, co-founder of ND News & Review, continued his family tradition at the Ohio State University for his undergraduate education. He then attended Texas Chiropractic College in Pasadena, Texas, where he received a doctorate of chiropractic with an internship focus on orthopedics and radiology. Dr. Tallman went on to medical school to earn a doctorate of naturopathic medicine at Southwest College of Naturopathic Medicine in Tempe, Arizona. 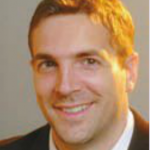 He is a board-certified, licensed chiropractic physician (DC) and a licensed naturopathic medical doctor (NMD). He is also board certified in physiotherapy. Dr. Tallman is in private practice in Scottsdale, Arizona, where he treats orthopedic and rheumatological conditions. Kim SY, et al. Magnetic resonance findings of acute severe lower back pain. Ann Rehabil Med. 2012 Feb;36(1):47-54. Jensen MC, et al. Magnetic resonance imaging of the lumbar spine in people without back pain. N Engl J Med. 1994;331:69-73.